Join and download your first walk free! An annual subscription of £18 gives you unlimited access to all these walks. You can print them out, make the guides into PDFs, download digital mapping files for your GPS and follow the routes on the Walkingworld app. Join now without obligation and you can choose one walk from the entire library before deciding whether you want to subscribe. Just find the walk you want and click to add it to your personal library. As a subscriber you can download walks direct to your mobile phone or tablet using the Walkingworld app. 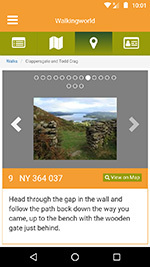 With this app you can follow the walk, complete with instructions and pictures, and see your position on an OS map. Other subscriber benefits include a generous discount at Cotswold Outdoor and Snow+Rock. If you join but decide not to subscribe you can receive our informative monthly newsletter, buy individual walks for £1.95 and use the Walkingworld app in a more limited way. There are also some free sample walks which are available on top of your chosen free walk. Most of the walks are in Britain but there's a growing collection in Spain and France, perfect destinations for a quick getaway. We are also building a collection of walks from cruise ports, including in Norway. Click the country in the menu on the left to browse our overseas walks. At Walkingworld we are constantly working to keep the walks up to date, dealing with any changes and corrections immediately. New walks are also being added every month. If you ever need help on using the site or advice on any aspect of walking, just get in touch using the Contact link in the menu above. As a subscriber you can set up a directory entry at no extra cost. The directory is a great way to promote a guest house, website or walking group to fellow Walkingworld members. A link to your directory entry appears on every local walk. Written by Walkingworld founder Nicholas Rudd-Jones 'Urban Rambles' explores twenty of our most fascinating English cities on foot. Each walk is carefully planned to take in the best 'green bits', architecture and local history. A must for city dwellers and anyone on a city break who wants to get under the skin of the place. Find it at Amazon and other good booksellers. Currently there are 7360 walks to choose from.